Lens Description: In the pursuit to achieve the most outstanding image resolution in the 70-300mm class, Tamron’s Anniversary lens - the SP AF70-300mm F4-5.6 Di VC USD - utilizes an advanced optical design that features an LD (Low Dispersion) and an XLD (Extra Low Dispersion) lens element made from specialized materials that prevent chromatic aberration. As a result, the SP AF70-300mm F4-5.6 Di VC USD (Model A005) boasts sharper contrast and greater descriptive performance than all others in its class. In addition, it is the first Tamron lens sporting a USD (Ultra Silent Drive), Tamron’s very own auto-focus drive mechanism This USD mechanism delivers fast, making it a perfect telephoto zoom choice for photographing sports, racing, or other fast-moving subjects. The lens also boasts Tamron’s proprietary VC (Vibration Compensation) image stabilization to assist in handheld photography, not only at long focal length ranges where blurring is common, but also under low-lit conditions, dramatically enhancing photographic freedom. This combination of best in class image resolution, Ultra Silent Drive and Vibration Compensation is a new achievement of Tamron technology culminating in the production of a premium 70-300mm lens. This is my first review for this site, and felt like I could contribute so here it goes. Price: With the 100$ rebate you can get this lens for 350$, that said, it is one of the best bargains that you can make out there. Build: The build is really rather good, it is made of high quality plastics, and feel very sturdy I must say. It is rather heavy, but not overly so, and feels very solid in the hands. The zooming ring is a bit stiff, at least in my copy, but that really helps it from extending out when it is pointed down, especially since it doesn’t have a zoom lock. What is omitted to make the price cheaper are things like a focus limiter that would have helped increase focus speed, but for what you pay that is a minor point. Just to prove the build is solid, I used the lens out in the rain a couple of times, in rain that was between a drizzle to moderate rain, and it preformed flawlessly. Here I would give it a 3/5 overall for lenses, and a 4/5 or 5/5 considering what you pay. 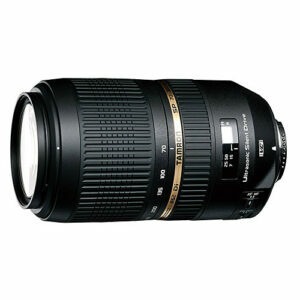 Autofocus: The Tamron uses a built in focus motor Tamron calls USD. On my Sony A100 which is an older body from 2006 the focus speed is alright, on a much faster body like the Sony A700 the focus is fast indeed. It isn’t on the same level as the Sony SSM motor or the pro motors from the other companies, but for the price it is very good. Accuracy is alright on both my bodies, it can miss at times in low light, but that might just be my cameras. I would give it a 3/5 for focusing, it is fast and good, but not going to exactly blow you away either. Vibration Reduction: Sony has in body so Tamron doesn’t add it to the Sony version, so I can’t really speak for that. Image Quality: I have compared it to the Sony 70-300G lens, and it is rather comparable, also other reviews note that it is on the same level as the 500$ Canon and Nikon 70-300’s out there. At 70mm wide open it is good, stopped down a bit and it becomes truly excellent. In the midrange between 135-200 it stays good wide open and very good stopped down. At these ranges I think it is at least as good if not better than the Sony 70-300G. That said, at 300mm is where it will start to lose a bit of ground. That isn’t to say it can’t get great results here, but wide open there is a bit of softness even in the center, stopping down helps though and it becomes quite good in the f/8-11 range. Overall I would rate the image quality as good to very good with some softness at the 300mm range. Image quality is easily 3/5 if not 4/5 considering you almost pay half in the canon/nikon case, and almost a 1/3 in the Sony case. Overall: I really do love this lens, for the price it is almost unbeatable. The build is very good, no problems with that. It is solid and feels good in the hands, the zoom is a bit stiff and there is no focus limiter, but these are minor points. The focusing system is good, and does a good job speed wise. And the image quality is truly great until 200mm and a little stopped down, only degrading in the 300mm range to an ok level. In the end I can only end this review with high praise, and highly recommend it for anyone that wants to get a lens in this range, but doesn’t want to pay more for the main brands. I give this lens a solid 4/5 considering price point and performance, it is just as good as the main brands for half the price. i have using this lens from last ten months. its amazing actually i am 100% satisfied with this lens. In 300 mm zoom it has maintains proper sharpness. In macro mode it has awesome blur effect but have little bit of noise. i mean in respect of 50mm prime lens has some less sharpness in objects.